How many Email Service Providers (ESP) to invite to a pitch? Home » Email marketing » How many Email Software Companies (ESPs) should be on your short list? “How many Email Service Providers (ESPs) should we put on our short list?”. Every time a marketer is selecting a new email marketing company this question pops up. No matter if you are looking for an Email service provider or the best Marketing Automation software you don’t want to take too long selecting it. And every additional vendor takes up more time and effort. So where do you draw the line? How many Email service providers should you go through an in-depth evaluation with, and at the end invite to pitch? On the side of the Email service provider, the number of competitors is an issue too. An email marketing pitch with many competitors diminishes the chance of them winning. They don’t want to put in (too much) effort in those cases. And it can be very valuable to have an enthusiastic ESP during the selection, that is willing to go the extra mile. Every ESP prefers to be in a selection with only a small number of others. Smart ESP business developers (aka salespeople) would try and probe a bit for that nugget of “who else is in there” information. But if they don’t, how about you make sure to positively manage expectations and speak out that you want them to make the effort. So being selective up front saves you time and brings you extra value. But how to do that and how selective should you be? First off, it is important to see what we would call a short list/pitch. I am referring to the final stage(s) of the selection process. Marketers come to have high expectations, maybe sometimes too high of email marketing service providers when it comes to pitches. It takes quite some effort from both sides to go through an an Request for Proposal (RFP), demos and presentations. But that doesn’t mean you shouldn’t browse around and search first. Maybe you are not experienced at all, or it has been a while since you looking into the market for new MarTech. It is good to get a feel for the market and all the players. 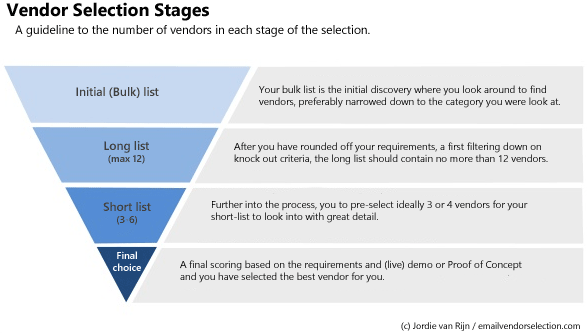 So it starts with your bulk list (all in the category, very limited filtering) and then your long list (first filtering, strike out on knock-out criteria). The trick is to filter it down as fast as possible. How long should your ESP long list be? The total number of email service providers is over 450. So just only looking through the complete list of ESPs is already a big task, but there is a solution. When a company approaches me to guide their selection, they sometimes already started on their own “awkward” short list, that don’t make a lot of sense. Often enough because they group together candidates that are in very different categories. That indicates that there maybe is no real sense of the requirements or they don’t yet know what type of ESP or Marketing Automation provider they are looking for. You can already narrow it down a lot by starting your long list based on the type of email marketing solution that is best for you. Alternatively, it also happens that vendors are misjudged and got on the shortlist – for instance, because of features they list on their site (but really they don’t have the real thing). Getting some help in selections can greatly speed up that process. As an experienced consultant can shorten your list using proper knock-out criteria (the criteria that lead to immediate elimination). If your long list has more than 20 Email Service providers, it isn’t a long list. It’s a bulk list and you haven’t been selective enough. Keep your long list to a maximum of 12. Going from a long to a short list of email marketing vendors requires a better and clearer definition of what you want. Note that we aren’t up to the pitching yet, the short list should only contain candidates that are real candidates to invite. Now that is the difference. Your short list should contain a maximum of anywhere from 3 to 5 esps. That is the maximum, having less is perfectly alright. If you can restrict it further before really getting into a ‘selection mode’, narrow it down. Hitting a number of 4-5 potentials and you are done. But possibly you still have a few that don’t seem to perfectly fit, but possibly could be a fit…. hmmmm…. What to do with those? This is also where the expertise comes in, as an experienced consultant or agency that does this selection more often has less to investigate (they already know from experience or can quickly find out). But if you are going at it alone, decide to either investigate further or put them on an “on hold to investigate” part of the list. Those reserves can be activated if there is no satisfactory solution found from the short list you had made. Be sure to write down your arguments when NOT selecting an Email service provider at this point, general good plus bad points you came across. You might find that your requirements could change over time. In that case, it is good to know why you eliminated certain vendors. This also helps to share and get more of your colleagues to add their 2 cents. They can comment on “opinions” by making them explicit. So you don’t get any colleagues going for the “let’s take a step back” or (unintentionally) sabotage the process. Based on the complexity, scope, and size of the project you would like to investigate further and talk to some of the email service providers. You might want to go out and see online demo’s and their website to be able to do a sanity check if vendors really can fulfill the requirements and supply the service you were looking for. Some might not cut it, and can safely be removed from the shortlist. Now with the shortlist in your hand, do you have any favorites? Think about how confident you are, this also depends on the experience with both email marketing and the selection process. Ask 2 to 4 email vendors to present their case and pitch. Less confident, looking for a more creative solution or have a more complex or high stake situation? In that case, you might want to look into 3-6 email suppliers to pitch on your project. If you want to deviate from the numbers given in this article, trust me, it isn’t necessary to invite more. Make sure that the vetting part is done right and you have a high-quality selection of ESPs in your pitch that will match the profile you were looking for. Invite as little as you can and as many as you need.